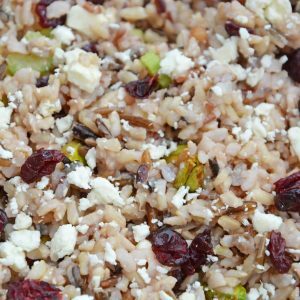 This Wild Rice Pilaf recipe is an easy side dish for your next potluck, picnic or dinner. Quick and easy to make in advance it's the best rice pilaf recipe! In a small bowl, whisk together extra virgin olive oil, Kosher salt and lemon juice. Toss gently with cooked and chilled wild rice. Add dried cranberries, celery, pistachios and crumbled feta cheese, toss to combine. If you've tried this recipe, come back to let us know how it was!